We’ve having a mellow Saturday morning. We just got back from a fabulous five-day trip to Turks and Caicos — Mason chilled with grandma Mimi in New York while we were gone — and the three of us are enjoying being back together again, at home. (It was so hard for me to leave the babe but Chris and I got some much-needed couple time and Mason finally got to really know his out-of-town grandma.) Mason is playing after polishing off four ounces of oatmeal mixed with Peach-Pear Puree, as well as two ounces of YoBaby banana yogurt — all this after ten ounces of formula when he woke up this morning. (The little guy is on the skinny side but he eats like a Sumo wrestler.) We’re drinking coffee, laughing at the babe’s antics. First, let’s talk nitrates. A lot of the moms in my ‘hood have been asking me what the deal is, so here’s the scoop. According to our pediatrician’s online guide to introducing solids, some foods shouldn’t be prepared at home to avoid excess nitrates: carrots, turnips, spinach, collard greens, and beets. I call it the N List. Why are nitrates so bad? The American Academy of Pediatrics reports that excessive nitrates from certain foods or well water can cause methemoglobinemia, a rare but dangerous type of blood condition that limits oxygen in the blood, particularly in babies younger than three months old. 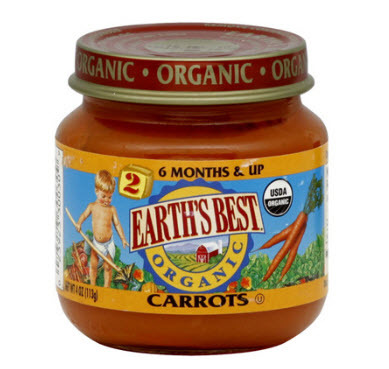 Methemoglobinemia is very rare — and some say it’s bunk that commercial baby foods contain fewer nitrates than homemade baby food. (See Maggie’s post in the comments section below for more detail about the report.) I can see both sides of the argument, but I’m going to trust my pediatrician on this one. We go with Earth’s Best for these eats. What do you think? Is it best to go with commercial foods when it comes to the N List? If so, what brands of food does your babe like? What a cutie you have and kudos for making your own baby food! Kudos too for taking a getaway with your hubby; couple time is important even if it’s just a quite night at home! “Because the intake of naturally occurring nitrates from foods such as green beans, carrots, squash, spinach, and beets can be as high as or higher than that from well water, these foods should be avoided before 3 months of age, ” This comes directly from the link you provided above to the AAP Well Water policy that explains what Methemoglobinemia is. "For babies younger than age 4 months, also avoid home-prepared spinach, beets, turnips and collard greens, which may contain high levels of potentially harmful compounds from soil (nitrates). " I think the most important item to note is that the "risk" refers to babies under the age of 3 months and happily, the AAP and others always note that there is no reason to introduce solids to infants prior to 4-6 months of age. The other important item is that well water contamination [with nitrates] is a far greater danger than a serving of carrots; as the AAP article you linked to states. As with many old school recommendations – start with boxed rice cereal and only serve green veggies before orange/or before fruits – many pediatricians are not up to date on the issue of nitrates. Many also do not know how the conversion of nitrate into nitrite (that which causes Methemoglobinemia) falls sharply once baby is over 6 months of age due to the acids in the intestines. I am not in any way saying that you should distrust your pediatrician! I am only saying that doing more research into nitrates and homemade baby food might ease your mind (or not). The issue of nitrates is always one that makes my hackles rise because this "demon" often scares parents away from making any of their baby's food at all 😦 And when I hear that "baby food companies remove the nitrates" I go more berserk because this is simply and totally untrue! Thanks again and happy pureeing!